Never Start By Saying No! Newsflash: Despite global warming it is officially Summertime. The signs are everywhere. Kids are off from school. There are many more outdoor activities and the days are longer. This all adds up to less reasons to be stuck working. You’ll need a boost to get the time away from work you need. Try this productivity hack to spend your time off without stress. Learn how to say “no” to your boss so that you can enjoy your downtime. Never start by saying “no”. 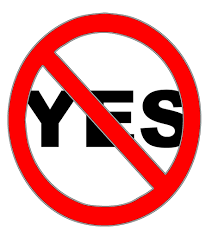 Learn how to say “yes” and accomplish the “no”. Learn to meet both of your needs by setting boundaries and figuring out what you must and can accomplish. This is funny advice from me. Since I have a whole chapter in my book Managing Annoying People about how to just say NO. Last week I urged you to say “no” for cleaner focus on your priorities. Click here to read why your efficiency hacks are not working, This advice is a subtle twist on the concept. I write, speak and mentor on workplace dynamics; building powerful engaged teams and managing people/teams that annoy you and steal your energy and time, even though they are competent. I counsel people to learn to use boundaries. We work on how to distill the situation and then be able to clearly and concisely communicate to get results. I understand how messy it is out there folks. Everyone is doing more with less time, staff and resources. How your react sets the tone for your relationships. I know, I managed 10,000 people and had to learn who would get it done, even if not my way! How Do I Use this Productivity Hack? The trick is to meet your boss’s needs (or your employee’s needs) and do it on your timetable and rules. Let’s say the Boss wants you to work over the weekend to finish a project. You have to quickly scan — is it doable? What resources do I need? How can I get this done? The goal is to figure out other ways to finish the project without sacrificing your own time and needs. It’s really helpful if you think about the instructions for putting on an oxygen mask on an airplane. Put your oxygen mask on first and then attend to those around you. Boss: I need you to stay all weekend and finish the XYZ Project. Response: Of course (the more enthusiastic the better). I’ve been wanting to hammer that out and get it done all week. Boss: Great I can count on you? Response: Yes, you can. Let’s talk about the specifics. I can tackle it hard on Thursday and Friday and then if needed, Sunday night. We will have it bright, shiny and ready Monday morning! Boss: Great, so you’ll be in the office on Saturday? Response: Probably not especially since the plan I outlined will work — we will have what we need. The goal is to get the project finished by Monday morning. I can do that. Do you need anything else? In a situation when it’s an event or coverage on a very specific date and time and it conflicts with with your needs – remind your boss that if you don’t have some breathing room and downtime, you will not be fresh and peppy to do all the other things you need to do for the job, The idea is for the boss to be able to relate personally to your situation. It would help to remind your boss that you need to take care of yourself (and your family) so that you can “rock” your work place responsibilities. Express your disappointment. Reiterate that you are re so glad that they asked and you would love to do it you’ve been looking for those opportunities. Problem solve on who else may be available or a good fit; don’t look at all the obvious options that your boss has thought about. Describe how you will connect to people at the event or follow up even though you won’t be there. Remind your Boss – they can count on you to get accomplished what needs to be accomplished. If you are interested in talking more about this, please email me at ilene@alignedworkplace.comor reach me at 212.787.8581.